Proprietary Name: Clindamycin Phoaphate Topical Solution Usp, 1% What is the Proprietary Name? Non-Proprietary Name: Clindamycin Phosphate Topical Solution Usp, 1% What is the Non-Proprietary Name? Clindamycin Phoaphate Topical Solution Usp, 1% with NDC 21922-002 is a a human prescription drug product labeled by Encube Ethicals Private Limited. The generic name of Clindamycin Phoaphate Topical Solution Usp, 1% is clindamycin phosphate topical solution usp, 1%. The product's dosage form is solution and is administered via topical form. FDA Application Number: ANDA209914 What is the FDA Application Number? 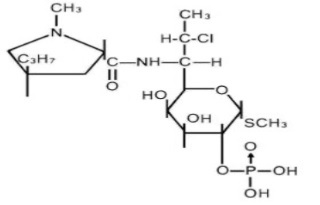 Clindamycin phosphate topical solution USP, 1% contain clindamycin phosphate, USP, at a concentration equivalent to 10 mg clindamycin per milliliter.Clindamycin phosphate is a water soluble ester of the semi-synthetic antibiotic produced by a 7(S)–chloro-substitution of the 7(R)-hydroxyl group of the parent antibiotic lincomycin.The solution contains isopropyl alcohol 50% v/v, propylene glycol, sodium hydroxide and purified water. The structural formula is represented below:The chemical name for clindamycin phosphate is Methyl 7-chloro-6,7,8-trideoxy-6-(1-methyl-trans-4-propyl-L-2-pyrrolidinecarboxamido)-1-thio-L-threo-α-D-galacto-octopyranoside 2-(dihydrogen phosphate). 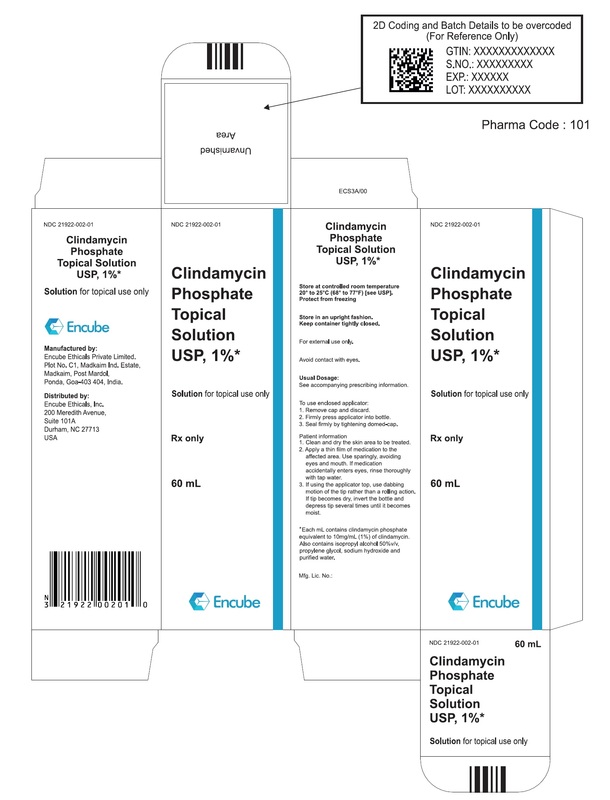 Although clindamycin phosphate is inactive in vitro, rapid in vivo hydrolysis converts this compound to the antibacterially active clindamycin.Cross resistance has been demonstrated between clindamycin and lincomycin.Antagonism has been demonstrated between clindamycin and erythromycin.Following multiple topical applications of clindamycin phosphate at a concentration equivalent to 10 mg clindamycin per mL in an isopropyl alcohol and water solution, very low levels of clindamycin are present in the serum (0–3 ng/mL) and less than 0.2% of the dose is recovered in urine as clindamycin.Clindamycin activity has been demonstrated in comedones from acne patients. The mean con­centration of antibiotic activity in extracted comedones after application of clindamycin phosphate topical solution USP, 1% for 4 weeks was 597 mcg/g of comedonal material (range 0–1490). Clindamycin in vitro inhibits all Propionibacterium acnes cultures tested (MICs 0.4 mcg/mL). Free fatty acids on the skin surface have been decreased from approximately 14% to 2% following application of clindamycin. Clindamycin phosphate topical solution USP, 1% is indicated in the treatment of acne vulgaris. In view of the potential for diarrhea, bloody diarrhea and pseudomembranous colitis, the physician should consider whether other agents are more appropriate (see CONTRAINDICATIONS, WARNINGS and ADVERSE REACTIONS). Clindamycin phosphate topical solution USP, 1% is contraindicated in individuals with a history of hypersensitivity to preparations containing clindamycin or lincomycin, a history of regional enteritis or ulcerative colitis, or a history of antibiotic-associated colitis. Orally and parenterally administered clindamycin has been associated with severe colitis which may result in patient death. Use of the topical formulation of clindamycin results in absorption of the antibiotic from the skin surface. Diarrhea, bloody diarrhea, and colitis (including pseudomembranous colitis) have been reported with the use of topical and systemic clindamycin. Studies indicate a toxin(s) produced by clostridia is one primary cause of antibiotic-associated colitis. The colitis is usually characterized by severe persistent diarrhea and severe abdominal cramps and may be associated with the passage of blood and mucus. Endoscopic examination may reveal pseudomembranous colitis. Stool culture for Clostridium difficile and stool assay for C. difficile toxin may be helpful diagnostically.When significant diarrhea occurs, the drug should be discontinued. Large bowel endoscopy should be considered to establish a definitive diagnosis in cases of severe diarrhea.Antiperistaltic agents such as opiates and diphenoxylate with atropine may prolong and/or worsen the condition. Vancomycin has been found to be effective in the treatment of antibiotic-associated pseudomembranous colitis produced by Clostridium difficile. The usual adult dosage is 500 milligrams to 2 grams of vancomycin orally per day in three to four divided doses administered for 7 to 10 days. Cholestyramine or colestipol resins bind vancomycin in vitro. If both a resin and vancomycin are to be administered concurrently, it may be advisable to separate the time of administration of each drug. Diarrhea, colitis, and pseudomembranous colitis have been observed to begin up to several weeks following cessation of oral and parenteral therapy with clindamycin. Clindamycin phosphate topical solution USP, 1% contains an alcohol base which will cause burning and irritation of the eye. In the event of accidental contact with sensitive surfaces (eye, abraded skin, mucous membranes), bathe with copious amounts of cool tap water. The solution has an unpleasant taste and caution should be exercised when applying medication around the mouth.Clindamycin phosphate topical solution USP, 1% should be prescribed with caution in atopic individuals. In clinical trials with pregnant women, the systemic administration of clindamycin during the second and third trimesters, has not been associated with an increased frequency of congenital abnormalities. There are no adequate studies in pregnant women during the first trimester of pregnancy. Clindamycin should be used during the first trimester of pregnancy only if clearly needed. It is not known whether clindamycin is excreted in human milk following use of clindamycin phosphate topical solution USP, 1%. However, orally and parenterally administered clindamycin has been reported to appear in breast milk. Clindamycin has the potential to cause adverse effects on the breastfed infant’s gastrointestinal flora. If oral or intravenous clindamycin is required by a nursing mother, it is not a reason to discontinue breastfeeding, but an alternate drug may be preferred. Monitor the infant for possible adverse effects on the gastrointestinal flora, such as diarrhea, candidiasis (thrush, diaper rash) or rarely, blood in the stool indicating possible antibiotic-associated colitis. The developmental and health benefits of breastfeeding should be considered along with the mother’s clinical need for clindamycin and any potential adverse effects on the breastfed child from clindamycin or from the underlying maternal condition. Clinical studies for clindamycin phosphate did not include sufficient numbers of subjects aged 65 and over to determine whether they respond differently from younger subjects.Other reported clinical experience has not identified differences in responses between the elderly and younger patients. In 18 clinical studies of various formulations of clindamycin phosphate using placebo vehicle and/or active comparator drugs as controls, patients experienced a number of treatment emergent adverse dermatologic events [see table below].Number of Patients Reporting Events Treatment EmergentAdverse EventSolutionn = 553(%)Gel n=553 (%)Lotion n=160(%)Burning62 (11)15 (10)17 (11)Itching36 (7)15 (10)17 (11)Burning/Itching60 (11)# (-)# (-)Dryness105 (19)34 (23)29 (18)Erythema86 (16)10 (7)22 (14)Oiliness/Oily Skin8 (1)26 (18)12*(10)Peeling61 (11)# (-)11 (7)# not recorded * of 126 subjectsOrally and parenterally administered clindamycin has been associated with severe colitis which may end fatally. Cases of diarrhea, bloody diarrhea and colitis (including pseudomembranous colitis) have been reported as adverse reactions in patients treated with oral and parenteral formulations of clindamycin and rarely with topical clindamycin (see WARNINGS). Abdominal pain and gastrointestinal disturbances, gram-negative folliculitis, eye pain and contact dermatitis have also been reported in association with the use of topical formulations of clindamycin. Topically applied clindamycin phosphate topical solution USP, 1% can be absorbed in sufficient amounts to produce systemic effects (see WARNINGS). Apply a thin film of Clindamycin phosphate topical solution USP, 1% twice daily to affected area. Keep containers tightly closed.